Don't panic. "The Rough Guide to The Hitchhiker's Guide to the Galaxy" explores the ever-expanding universe created by Douglas Adams - the must-have companion for both long-term enthusiasts and those discovering the Hitchhiker's stories for the first time. You'll find everything you need to know about the stories so far including the saga's numerous incarnations: books, TV show, movie, radio series and more. 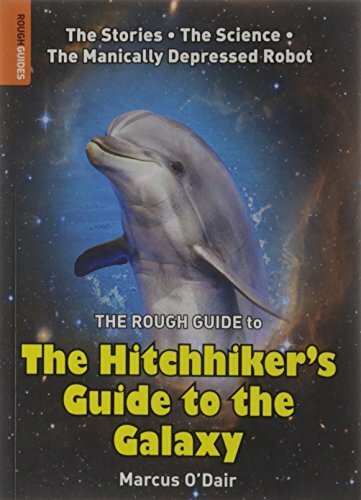 The guide covers key Hitchhiker's concepts and plot devices from tea, cricket and towels to small yellow fish and the stories behind all your favourite characters: Ford Prefect, Arthur Dent, Zaphod Beeblebox, Trisha McMillan and, of course, Marvin, the paranoid Android. The guide features useful background on the life and times of Douglas Adams unveilling his influences and passions and an overview of his other works. Newcomers will find the guide packed with accessible information whilst committed fans will love the online resources section which includes the lowdown on the official fanclub, ZZ9 Plural Z Alpha. View More In Consumer Guides. If you have any questions about this product by Brand: Rough Guides, contact us by completing and submitting the form below. If you are looking for a specif part number, please include it with your message.